Here’s another new website design, well, actually more newish than new, that I want to show off to you. It’s for our client Superyards. 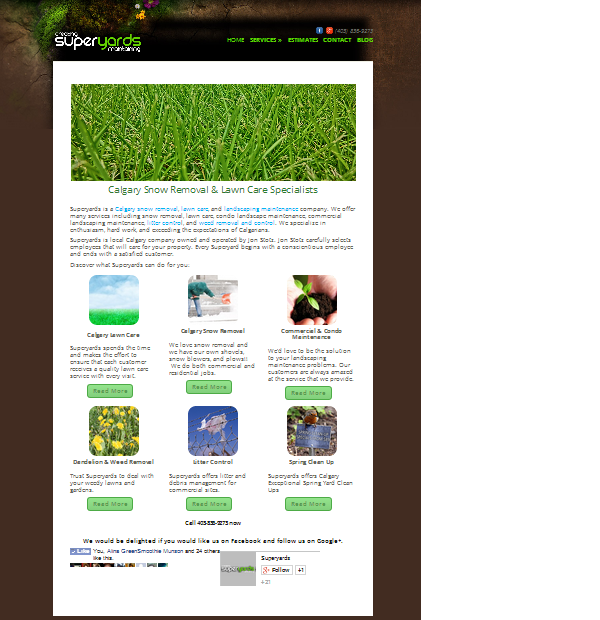 Superyards is a small, local Calgary lawn care and snow removal company. Besides lawn care and snow removal, they also do litter removal, weed control, and yard maintenance for both both commercial and residential clients. They ARE super: super-friendly, super-hard working, super-enthusiastic and super-happy working outside, cleaning up and maintaining people’s yards and business landscapes. They also are multi-faceted, offering a variety of services. So we wanted a web design that was equally super: friendly, happy, multi-faceted, and clean-looking. We also wanted to maintain their brand and logo in a more trendy, newer generation design that is also mobilely responsive. We succeeded. Take a look. The front page shows all their services at a glance and is colorful and clean. Each column is divided into different photos and text that link to each of the different service such as lawn care and snow removal. It is mobilely-responsive design that looks good on any type of computer or device whether it is cell-phone, tablet, netbook, notebook, or desktop. It looks small because I reduced the size of the screen capture to show you the whole page without scrolling. Notice how the design goes thinner and longer but still looks good on a “smaller” screen. If you change the size of the window you can see the changes the responsive web design. That way it looks good on tablets and cell phones as well as large screens. If you would like Ducktoes to do a website design for you whether or not you live in Calgary, please go here.